You always thought rabbits were cute, nice or dumb? Well they can also be dangerous. 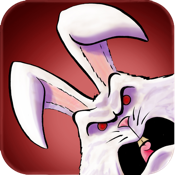 Fight through 20 levels full of zombie ducks, explosive rabbit soldiers and other mutant horrors. 4 different environments: prison, sanitarium, bunker and genetic lab. Finish levels to unlock arcade modes, and finish arcade modes to unlock bonuses.